Hope you all have a Fabulous day & thanks so much for dropping by! Shannon this birdie and the bird box are so pretty what a lovely card ,I love it . Fabulous design and the colours are beautiful. This is a gorgeous card Shannon, lovely image, and fab layering! Love the embossed label too. Hi Shannon what a lovely lovely card. The colors are so happy as I look out the window to see the snow blazing down. The DPs are gorgeous and the image is colored beautifully. Have a great day!! So sweet, cute, and pretty all rolled into one fantastic card! Precious. Shannon, this is so, so cute! Really a darling image. I might NEED it! Love how you paper pieced the bird house. I was wondering how you colored it, you clever girl! Awesome coloring on this adorable spring card! and love the pretty papers and layout! It has gone cold again here now and quite windy tonight! although the sun did manage to struggle through earlier today!! Awww, what a sweet card! Gorgeous colours, awesome colouring! I'm so glad you like my sketches, thank you for using this one! 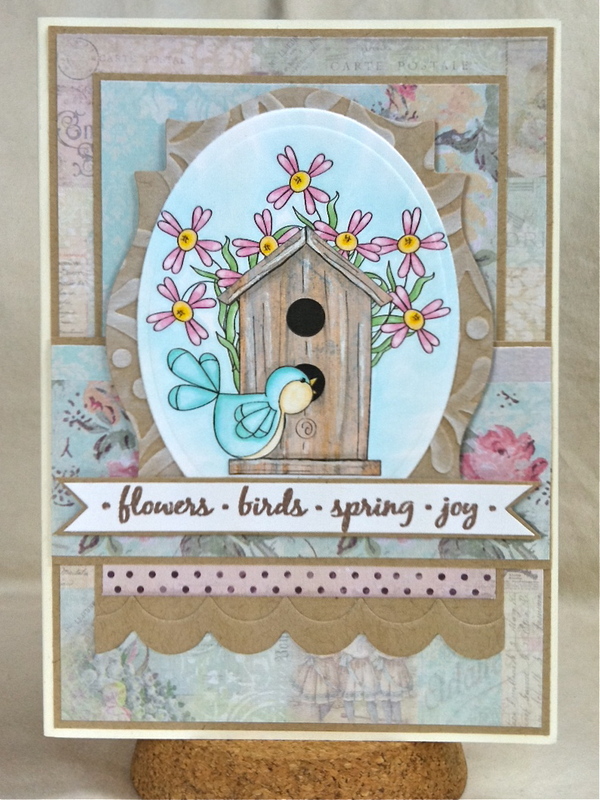 A perfect card for spring with that sweet little bird! I love these soft pastel colors you chose and the image is so adorable! Happy Spring!! This is so sweet, the image is telling me it is spring time :) I like the die's you used with it and the paper. Ooh this is so pretty!!! Love that sweet bird!! Awww this is so sweet Shannon! I love the soft colors and your gorgeous papers!! Oh my gosh - I think this is my very favorite. I love birds and bird houses. Delightful work Shannon!! !